It is hard to think of a mainstay of law enforcement more stirring to memory than the pump-action, 12 gauge shotgun. From the Winchester Model 12, to the par excellence Remington 870, shotguns have been in the trunks of squad cars for many decades and are as much a part of police culture as handcuffs, night sticks, and badges. In recent years, modern sporting rifles have found themselves in many squad cars and for pretty good reasons. They are light, have a high capacity, a very effective and highly accurate, and have essentially no recoil. These are all good reasons to have one in the inventory. However, the shotgun has not lost its place. The 5.56 rifle is good for a lot of things but it will not put down a bull moose or black bear. It’s great at medium ranges, but give me a shotgun any day of the week if I am facing a violent aggressor in a hallway or close distance alleyway. The shotgun will put down a human with one shot most of the time. The biggest gripe with the 12 gauge shotgun has historically been the punishing recoil. It’s not horrible for bigger guys who have enough meat to absorb it, but it can be downright brutal for small men and women. But things have changed with excellent advances in munitions. 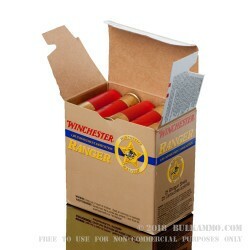 Winchester Ranger is a LE-exclusive line of munitions which includes a low recoil 00 buckshot. This is a 2 ¾” shotshell with eight pellets, registering 1,145 ft/sec at the muzzle and a healthy 1,190 ft-lbs of energy. 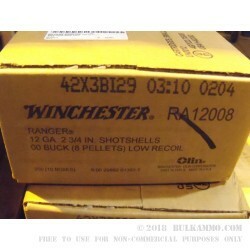 By far and away the best way to pick Winchester Ranger 12 gauge 00 buckshot is in bulk, and now is a great time to do it while it lasts. Do you and your shoulder a favor and grab up a case or two today. Q: I like to compare the specifications ( velocity, etc) information provided on the box when reviewing different ammo when shopping, my question is how can I view this information on your site? A: We're working on adding this info to the site. 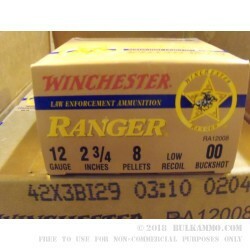 The velocity of this Winchester Ranger 00 Buck ammo is 1145fps. Q: Would this round be appropriate in a Saiga 12? Does it preform well in a clip(magazine) style feed? A: Saiga 12s are hit and miss. They often need parts replacement or tuning to reliably cycle various types of shells. However, once this has been accomplished, many Saiga 12 users find that low recoil buckshot such as this Winchester Ranger 00 Buck is reliable in their shotgun. Q: Does lowering the recoil change the effective range of buckshot? A: Winchester Ranger Low Recoil 00 Buckshot is loaded to the same velocity as the standard Ranger 00 Buck - it simply has one less pellet, 8 instead of 9. This reduced mass is what contributes to the lower recoil. Thus, the effective range is approximately the same as the standard load. Q: Would this have less recoil then the Winchester Winlite WL1200? A: Recoil will be comparable, perhaps slightly lighter. The WL1200 has 9 pellets traveling at 1125fps, while the Ranger has 8 pellets traveling at 1145fps. Q: Is there an effective "shelf life" for this type of ammo? A: Properly stored in a cool, dry place, this ammo can last for decades. A: Yes, this is one of our best deals on bulk defensive shotgun ammo. Q: What makes this round low-recoil? Does it have less powder, thereby resulting in less velocity? A: In a non-reciprocating action, recoil is a function of weapon weight, projectile mass, and projectile velocity. Ammo manufacturers cannot dictate the weight of your firearm, so they must reduce the overall mass (weight or number of projectiles) or velocity in order to reduce recoil. This ammo has a lower muzzle velocity than some other 12ga 00 buckshot, but is still devastatingly effective. Q: What makes low recoil rounds low recoil? Do they have less penetration than regular rounds? I'm wondering specifically about walls in a home or an apartment. A: Both low recoil and standard 00 buckshot from a 12 gauge shotgun will penetrate multiple interior walls, as will any load or bullet that will also reliably incapacitate someone who is intent to harm you or your family. A: Recoil can be reduced by increasing the weight of the firearm, decreasing the mass of the projectile(s), or decreasing the velocity of the projectile(s). 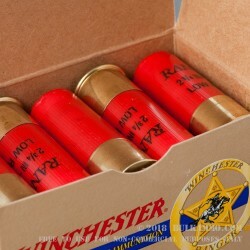 These Winchester 00 Buck shells have 8 pellets instead of 9, and are loaded to a lower velocity than some other types of buckshot, resulting in lower recoil. Q: Can you please explain the difference between Low-recoil ammunition and "regular" loads? Are there any drawbacks to selecting one over the other? 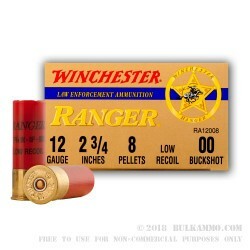 A: Low recoil ammunition like this Winchester Ranger 00 buckshot is so named because the mass and/or velocity of the projectile(s) has been reduced - these shells have only 8 pellets instead of 9 like some other loads. While this does have a slight negative effect on terminal performance, the results of being shot with 00 buck are still devastating, and the reduced recoil may allow the shooter to be more effective. A: Yes. It would be suitable for either purpose. However, for hunting, a more powerful load might be better if you're confident in your ability to deliver one well-placed shot. This is more ideal for law enforcement or self defense purposes, where fast follow-up shots might be vital.